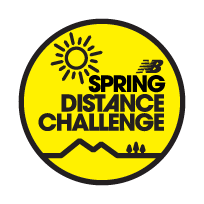 Help us hit the New Balance Spring Distance Challenge goal of 2.5 million miles. Strava is teaming up with New Balance for the NB Spring Distance Challenge. We want to challenge you and the rest of the New Balance community to collectively run over 2.5 million miles. If you get as far as 60 miles, you'll get a finisher's badge for your Strava profile, but it doesn't mean you need to stop there. Spring is a great time to do this – to leave behind the last vestiges of winter and indoor training, and get back out in the sunshine after months of snow (at least around NB’s home turf in Boston!). For us to hit the NB Spring Distance Challenge of 2.5 million miles we need everyone out and running. So go grab some friends, get running, log those miles, and let’s beat this challenge! Athletes that run over 60 miles during the Challenge will earn a badge in their Trophy Case. All activities logged during the Challenge period must be uploaded to Strava no later than three days after the Challenge ends. Run hard and be safe.